Dental APT is the advanced productivity tool suitable for all Dental Labs of varied size and capacity. 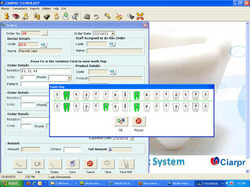 It provides the industry’s most comprehensive and powerful management systems with right options and processes that works well for the technicians and dental ceramists. Dental APT is customized software for Dental Labs for managing their interactions with doctor on other medical foundations. It keeps track of the orders processing, delivery management, communication management, generate invoice, receipts and analysis reports. Most striking feature of this application is our communication tool. The lab can communicate with the doctors by sending SMS with their unique Sender ID. The lab can enjoy various touch points with their vendors and customers. Founded in 2009, Ciarpro Technologies is involved in developing technology-driven products for small medium enterprises in the Education, Healthcare and Logistics domains. Our management team has core technical competencies in managing a variety of projects in the domains of logistics, Healthcare education and banking which includes fortune 500 companies from the United States, Germany and Singapore.